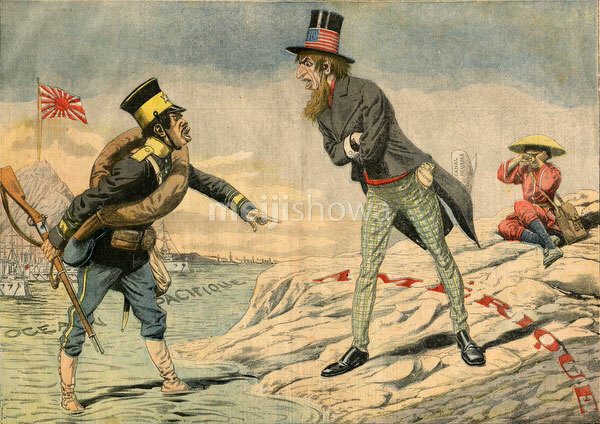 Caricature of the diplomatic crisis between Japan and the United States after the San Francisco Board of Education in 1906 (Meiji 39) enacted a measure to send Japanese and Chinese children to segregated schools. This violated a US-Japanese treaty signed in 1894 (Meiji 27). The dispute was concluded with the Gentlemen’s Agreement of 1907 (日米紳士協約, Nichibei Shinshi Kyoyaku), an informal agreement in which the US and Japan agreed to restrict Japanese immigration. It was never ratified by US Congress, and was ended by the Immigration Act of 1924 (Taisho 13), which banned all immigration to the US from Japan. Illustration published in the prominent French newspaper Le Petit Parisien on December 16, 1906 (Meiji 39). The original caption said, “Blanc Contras Jaunes” (White against Yellow). Japan is represented as a modern soldier backed up by a huge Pacific fleet, while the US is a civilian. China is portrayed as a powerless traditionally clad woman crying in the back.